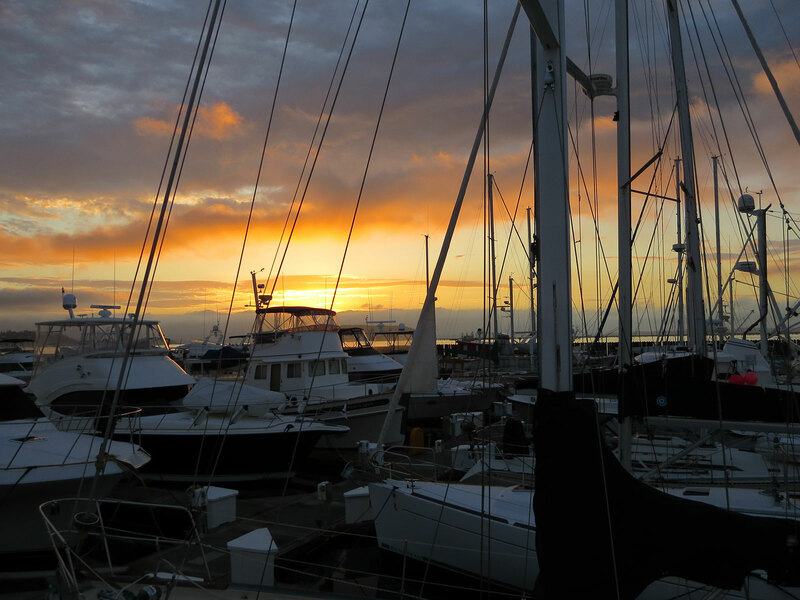 The glow of the morning sunrise was a stark contrast to the dim early morning light on boats in Anacortes Marina. Due to some of the issues on our Dent Island cruise, we got back to Anacortes Marina a few days later than we planned. Because we had to be back in Bend, we had only a few days to clean up the boat and get things in order after our cruise. The item of highest importance, needless to say, was doing more serious testing to determine the status of our house batteries. Jim tested all six of the house batteries, testing all the cells for shorts and specific gravity. He didn’t find any shorts, but three of the batteries failed on specific gravity. We have decided to replace those three batteries, then see if the existing three batteries continue to test okay and if our charging system works like it should. Our existing batteries have been cabled together in spoke fashion with different length cables for each pair. We found that this resulted in one pair discharging disproportionally and boiling off the electrolyte of the two batteries that are in the worst condition. Some additional research indicates that wiring the battery pairs in daisy-chain fashion should result in the batteries discharging more evenly. So, when Jim gets the new batteries, he also plans to hook up the batteries in daisy-chain fashion. We hope this will provide more reliable charging and improve the life of the batteries. Jim spent a day washing the boat (it’s a BIG job!) and I worked on cleaning up things inside. I squeezed in some time to join my friend Ann for an afternoon of bicycling on the nearby Tommy Thompson Trail. 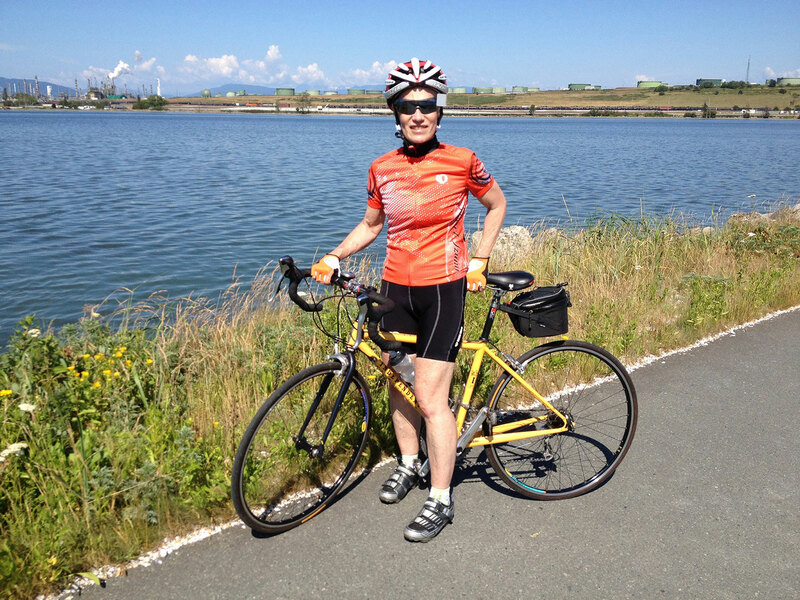 Back in Anacortes, I found time to do some bicycling on the Tommy Thompson Trail. The Anacortes refineries are in the background. 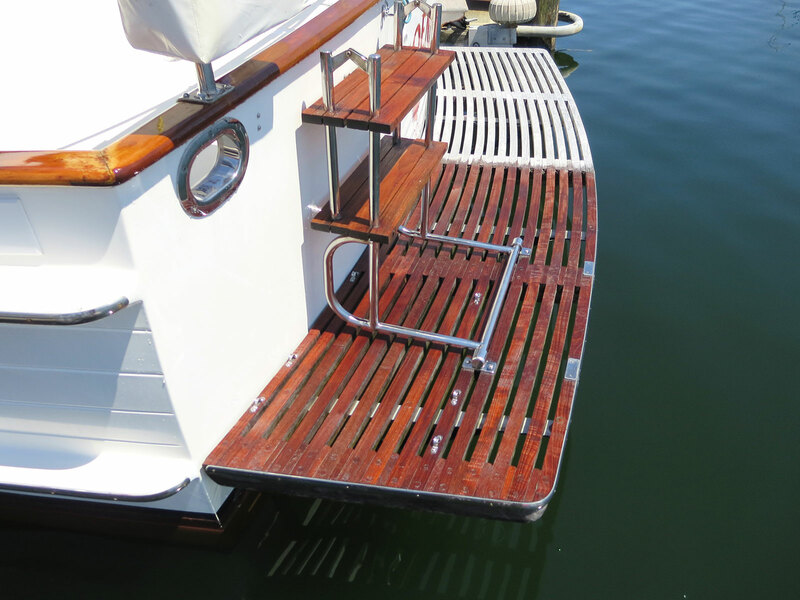 I also cleaned and brightened the teak decking on our boat deck and teak swim step. We didn’t have time to clean the teak before we left on our cruise, so it hadn’t been cleaned since last year and was overdue to be spruced up. You can see the difference it makes to clean our teak. Here the ladder and half of the swim step have been cleaned. The cleaned part in the foreground has the nice, warm teak color, while the half in the background is still gray…and waiting to be cleaned. I use Star brite Teak Cleaner and Brightener. I clean the teak in two steps…first by applying the teak cleaner to a dry surface, and then scrubbing it with a stiff brush. This cleans the dirt out from the grain of the teak. After a good wash down, I let the teak dry and then apply the teak brightener. This sits on the teak for a few minutes and then is washed off. It takes a lot of scrubbing, but it’s worth it to bring the teak back to its natural color. I don’t apply teak oil after this cleaning process because I have found that the oil tends to trap in dirt, which requires more frequent cleaning. The turkey sliders were really good! We had ground turkey left in the freezer and a few potato rolls. 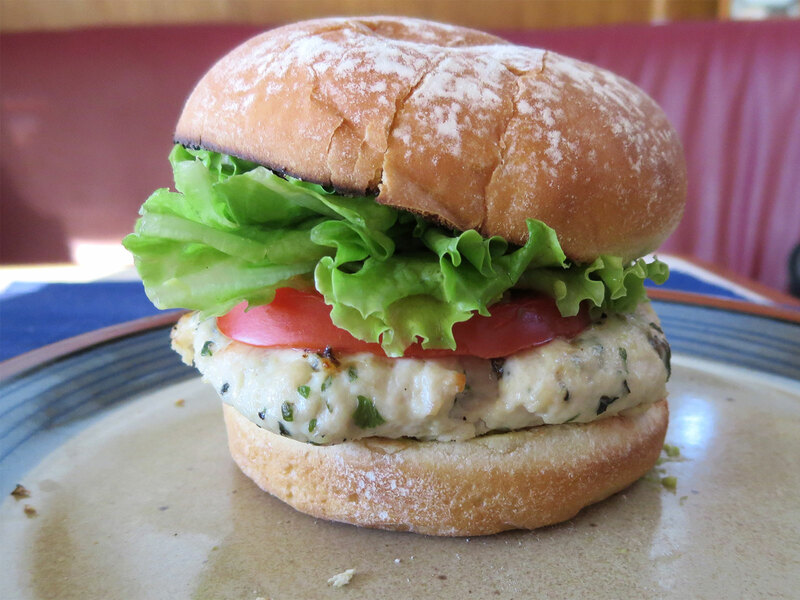 I decided to slice the rolls sandwich style to make turkey sliders, using a variation of my recipe for turkey burgers and making smaller patties. I whipped an avocado and seasoned it with salt and pepper to make a spread that goes well with the other flavors, and added a sliced tomato and lettuce. We barbecued the turkey patties and had a tasty meal. It took a whole day to pack our things and load up the car for the drive back to Bend. A westerly wind blew relentlessly all day long, which gave us some additional challenges in carrying things up the dock. At least the sun was shining! It turned colder too, and we were back to jeans and heavy sweatshirts. Our drive back to Bend from Anacortes was mostly uneventful (the best kind of drive), except for some construction delays. It’s summertime on the highways, and construction is to be expected. We’ll be busy with house projects for a while, but will be returning to our boat later this summer to work on boat maintenance and maybe do some more cruising. This entry was posted in Cruising, Food, Life Aboard, Maintenance, Projects and tagged Anacortes Marina, marine batteries, star brite teak cleaner, teak, teak cleaning, testing batteries, Tommy Thompson Trail, turkey sliders by Sailor Lady. Bookmark the permalink. You folks have the energy of 12 year olds! My goodness, I do think that boat takes more up keep than the Swift. But your love for it makes it part of the whole experience. Can’t wait for you to get going again, that burger looks delicious. Bonnie, Thanks…but I suspect we might not be able to compete with 12-year-olds as far as energy is concerned. And, yes, cruising boats do require a lot of maintenance. Some is fun, and some not so much! I imagine it takes a bit to keep up your airplane too. Yes, that burger WAS delicious! Thanks for your comment! Just love this blog, keep us going and going and going! Nice to hear…and I totally agree!